Unique Craft projects start here. Delicate Butterflies made of feathers, and for making crafts uniquely yours, try our outrageous handpainted GIJoe toys to wear as jewelry or collage art. Beautifully molded and finished translucent mat-finished acrylic flowers and leaves. Flowers include morning glories, dogwoods, baby's brea, Iris, Calla Lilies, colorful leaves.... Lightweight and saturated with color, these flowers are great for any project that needs them in clusters and colors. Inexpensive beads, kitz, ideas for rainy day fun. We're adding new projects and fun materials all the time, so bookmark us now! Everything priced for kids party activities! 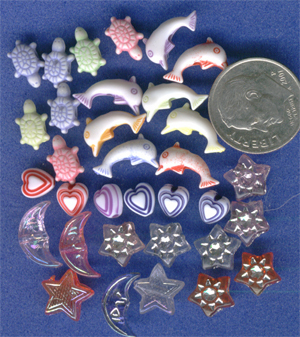 Tiny dolphins, turtles, stars, moons, hearts and more make up this small plastic bead mix for tweens. 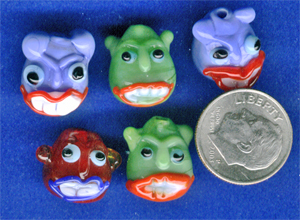 Glass lampwork monster faces are delightfully horrible! Great for scary pendants! 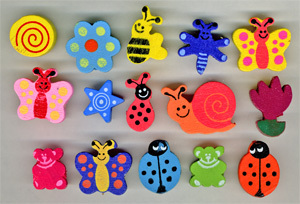 Brightly painted wood beads are perfect for toddlers! Teddy Bears, Stars, Ladybugs, Circles and Hearts are just the right size of little hands. Rhinestone Buttons!! They snap on and off, are large enough for small kids, and if you add them to netting or stiffened fabric rounds, they will make fabulous flowers! !